Wellness at Villageworks is a wellness center designed for practitioners who offer holistic and preventative health and wellness services. 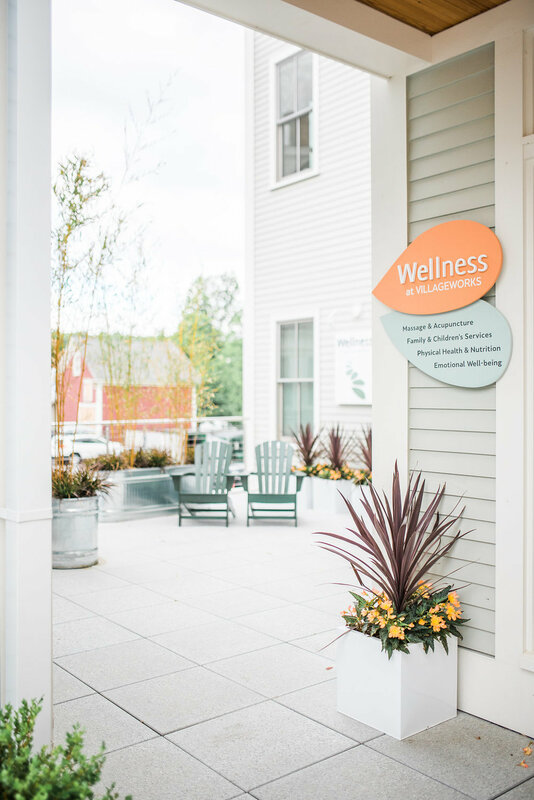 Wellness at Villageworks opened in 2015 as a work space for practitioners and businesses who focus on improving the health and resiliency of individuals, families and our community. Our private offices and shared common spaces help entrepreneurial wellness professionals create or grow their independent practices, while being part of a supportive community of peers. Our private, solar-powered office studios contain operable windows, great natural light, and soft cork flooring. Shared common areas include a large waiting room, courtyard, and community art gallery which combine to create a healthy and tranquil working environment for professionals and their clients. The health of our community is tied inextricably to the health of the environment. Wellness at Villageworks is solar-powered and built using resource efficient systems and low-VOC materials. Learn more about the environmental sustainability practices at West Acton Villageworks. Learn more about the practitioners and the services they offer. Wellness at Villageworks is part of West Acton Villageworks, a sustainable village redevelopment whose mission is to help build a healthy, diverse, interesting, alive, and sustainable community where independent businesses grow and thrive. Our neighbors include Revolution Community Yoga, Modern Barre, Acton Coffeehouse, True West Brewery, independent boutiques, and a variety of other small businesses and non-profits. Upstairs, The Gallery at Villageworks hosts concerts, lectures, films, storytelling slams, art exhibitions, and other programs. For a full list of neighboring businesses please visit the Villageworks Directory. We have a growing list of community partners that includes neighboring businesses within West Acton Villageworks, creative arts organizations and non-profits that promote community health.